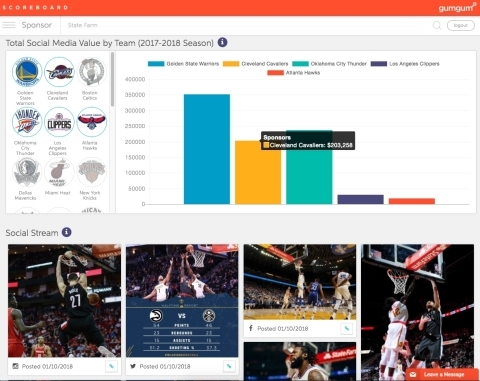 SANTA MONICA, Calif.--(BUSINESS WIRE)--GumGum Sports (http://www.gumgum.com/image-recognition/sports/), the leader in sports media valuation powered by computer vision technology, today unveiled real-time sponsor valuation data league-wide for the NBA. Via the GumGum Sports Scoreboard (a new leading benchmarking tool for analyzing media value generated from NBA team-owned social media accounts) the data shows relative value in comparison to the other teams and can be sorted/filtered by sponsor, team or ad buy type. By making the scoreboard free to all users, GumGum Sports brings transparency to sports sponsor buyers and sellers, and a real-time comparison of how social media is currently aiding some teams and brands above others. Instagram continues to be the leading platform in driving value. According to the Scoreboard, 80% of sponsorship value for NBA team accounts comes from Instagram. The Scoreboard has also found that engagement on Instagram compared to other social platforms has been greater than 10-15x for NBA team accounts. Additionally, the NBA's decision to create Jersey Patches has been a winning formula. Through the Scoreboard, GumGum Sports estimates that this new advertising opportunity will generate over $350M in value to these sponsors on social media alone. The overall winner for net value is Nike apparel. The Scoreboard estimates the value north of $500M per year across social media. These sort of social media values create a unique opportunity for teams because they can curate and design custom content to reach audiences they can't reach on broadcast and draw in a new fan base. GumGum Sports premium clients enjoy the only pure universal and global view of valuation in today’s measurement market through the ability to track all team- and non-team-owned accounts with sport and team detection using patented computer vision technology. GumGum Sports already provides media valuation services across the NBA, NFL, NHL, MLB, MLS, EPL, MMA as well as Stadium, a new, first-of-its-kind multi-platform sports network. Using advanced computer vision technology (not just logo detection) GumGum Sports scans both team-owned and non-owned accounts throughout the long tail of social media and provides social media valuation metrics. To access to the GumGum Sports Scoreboard, visit https://scoreboard.gumgum.com/ and sign up. GumGum Sports is a division of GumGum that leverages GumGum’s computer vision technology to help brands, agencies and rights holders go Beyond The Broadcast™ to capture the full media value of sports sponsorships that include visible signage across television and social media. By analyzing live broadcasts, social media and digital streaming, GumGum Sports provides accurate, timely, and comprehensive media valuations. They enable rights holders to retain and grow partner revenue and give sponsors the ability to track and optimize media value across a portfolio of sponsorships.